He's beautiful! I want to hug him! I think to ask what look is the best is like asking which is the best season of the year. Each one has its beauty. I like the fluffy look. He looks so cuddly. SLEEK!! It's all the rage - just look at me! well, you could look at it like this... you have *fluffy* and then you have **FLUFFY** . One is for hot weather and the other is for cold weather. And since he's always cuddly... especially since you work him soooo hard -- *f* or **F** -- just give that Doodle Dan a hug for all of us! I vote for fluffy stuffed toy, although I miss the "knopf im Ohr". Fluffy! So cute ... you just want to hug him and squeeze him! I'll vote for fluffy every winter. Our old pony who is red and grey and black with a white face and one blue eye changes from a sleek and handsome fellow in the spring, summer, fall into a heifer-look-alike each winter. But all of that good fuzz ensures he can weather anything. Here's to healthy equine critters! I love Dan! I want to kiss him! As you know, I am big on kissing donkeys! 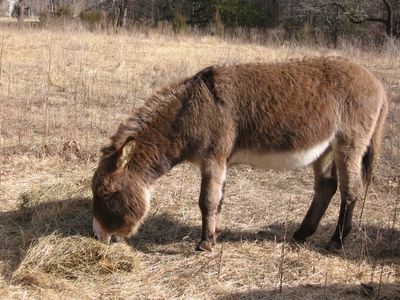 I've always wanted a burro. There is an animal shelter in a nearby county with an equine rescue that occasionally has them up for adoption. definately fluffy. he lookes so irresistably soft! give him a hug for me, will you?